Who Doesn’t Love a Fresh Start? Happy January 2nd everyone! A January 2nd post is way less cliche than a January 1st, New Year’s post, right? Probably not so much, but we are going with it anyway. I have always loved the start to a new year. Who doesn’t love a fresh start? Sure, it isn’t like all of your problems dissipated into thin air once the ball dropped, but there is something about the calendar starting over that makes people think that things can be new again. I am one who is extremely susceptible to the romanticism that is the new year and a fresh start, but there is something about 2015 that has me especially excited. I had a great 2014, but I have big hopes and plans for this year, and am feeling refreshed and ready to get back to the things I love; particularly running and writing, and possibly even tackle a few new passions and challenges. For starters, my poor blog needs to stop being ignored, and I need to be more diligent about following all of the amazing people I have connected with through WordPress. You all inspire me so much whether it be with your running, writing, or creativity. Just exposing myself to all of this more will help fuel my writing again. As far as my running goes, I am already signed up for two half marathons this spring. The Illinois Half Marathon on April 25th, and the Indianapolis Mini Marathon on May 2nd. This should set me up for a fall marathon (fingers crossed) come the fall. I might even add the Chicago Triathlon in August to my list. How about you guys? What are your goals and hopes for the new year? I have plenty of personal and professional goals as well, but I am still hashing those out. I think there is always room to be a better person , and I am sure 2015 will award me plenty of opportunities for growth. Happy New Year everyone. Let’s have an amazing 2015. P.S. 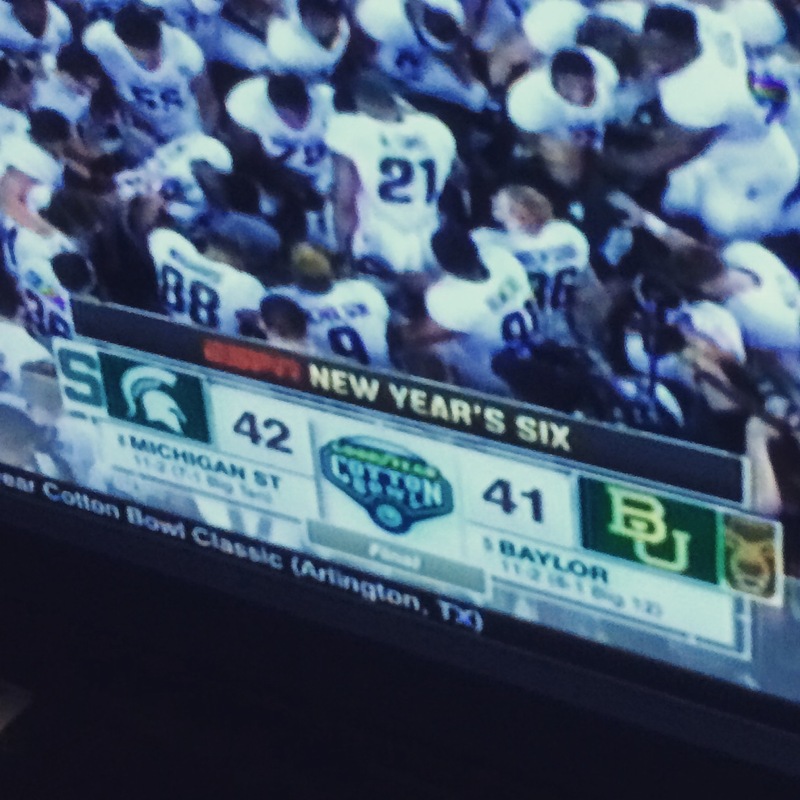 A little MSU, Big Ten Cheer for everyone out there. Probably the best football game I have ever seen in my life!